But, are all the apps successful in meeting their goal?? No, not at all. So what could be the reason? One of the reasons for an app not being successful is losing out while beating their competition and on the other hand, the reason could be the faults in the app. So in this blog, I’ll be discussing few of the features in details and how to avoid the shortcomings of a mobile app with infiCare- a top mobile app development company. 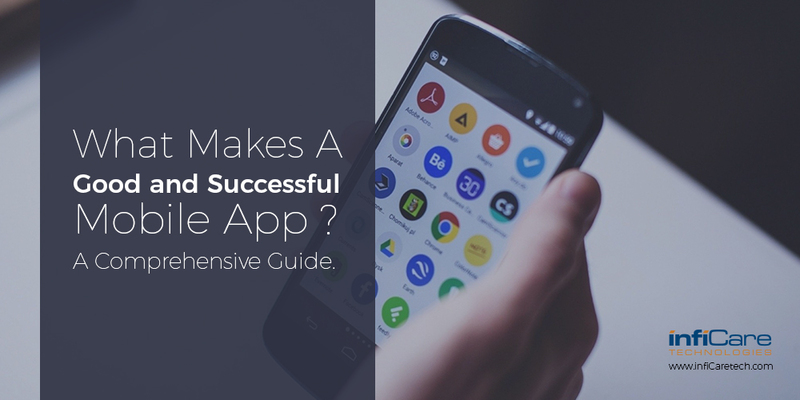 We have discussed in our previous blogs as well, and I would write it again- that the simplicity plays a vital role in making an app successful. So ease of complication should be the priority. You app isn’t of any if your user finds it difficult to use. An app that is complicated for the user, end up with making them uninstall the app immediately. To make the app simple- the UI design should b easy to grasp and the navigation should be properly visible and functional. For a user, the security of their data is the primary concern. Any app before getting started requires certain details of the user to customize things to his liking. This information could be name, contact number, age, e-mail id and so on. Therefore, it becomes necessary for the app to preserve these statistics gathered from the user and hence, the security should not be overlooked. If any app fails to meet the security requirements, your user will never choose to use the app and will recommend others as well not to use. As already discussed, apps are meant to simplify the daily task of the users. So why not make your app function online as well as offline? An app shouldn’t be developed only keeping in mind the online usability. Remember your app should work offline as well. To meet the user’s demands, the app needs to meet certain standards and specifications that keep on regular intervals of time. New features and innovative designs should be released with every app update. This would help in removing glitches and help in the smooth functioning of your mobile app. Today when everybody is becoming more and more socialized by making the best possible use of the Social Media platform. People just love sharing their day-to-day schedule with their followers. This could be anything like- their achievements, their mood, pictures and other sources of happiness on the platform. Or to go more in depth, I would say people love to share their emotions. Hence, it is important to have Social Media integrated into the app to make it simple for them to share anything directly from the app to their Facebook, Twitter, and LinkedIn account. It’s not just a one day show that you develop that you get a mobile app that grabs the attention of the users and serve their purpose spot on. It’s a continuous process that requires a proper planning during the development stage and efficient execution of those plans. So it’s always good to hire a mobile app development company that provides the best app development services along with marketing strategies for the app that can easily do the job for you. We are the top mobile app development company in the USA and we thrive on excellence and this is what makes us different from our competitors. Why wait?? Get a robust app developed for your business. For more details connect with our expert.